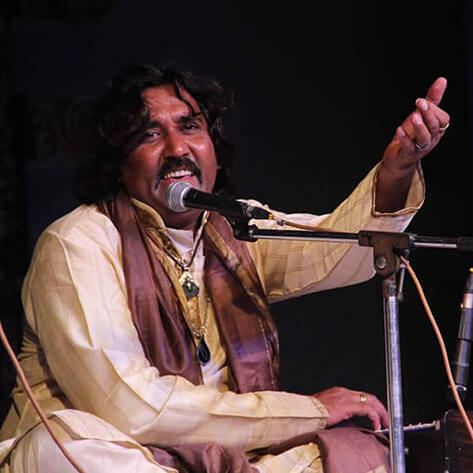 Meer Mukhtiyar Ali is a folk singer from Bikaner in Rajasthan. He was born in a small village called Pugal on the North-West frontier of India and belongs to the semi-nomadic community of Mirasis, who have been the traditional carriers of the oral tradition of SufianaQalam in India. Meer Mukhtiyar blends the Rajasthani folk idiom with refined classical to sing the poetry of Kabir, Mira and Sufi poets such as Bulleh Shah. Through the Kabir project, Mukhtiyar was spotted by world music circuits and made his international debut in July 2007. Since then, he has performed in Belgium, Sweden, China, Canada, Germany, and France. He has also lent his voice to a few films including Tashan (2008), Bombay Summer (2008), Kathai (2010) and Delhi in a Day(2011).